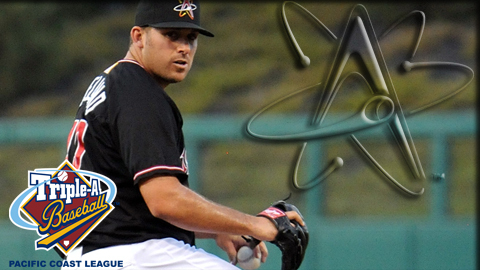 Albuquerque Isotopes left-hander Dana Eveland has been selected to the 2011 All-Pacific Coast League Team, consisting of a player at each position, including designated hitter, right-handed starter, left-handed starter, and relief pitcher and is determined by vote of league managers as well as media representatives. Eveland was selected as the team's left-handed starter. The left-hander has racked up 12 wins this season, second-most in the Pacific Coast League, while amassing a 4.38 ERA, which ranks eighth. Eveland, who was selected to the PCL mid-season All-Star Team and pitched a perfect inning in the Triple-A All-Star Game, has also held the league to a .260 batting average, fourth-lowest among all starters. On July 23, Eveland tossed a masterful three-hit shutout at Omaha, allowing just three singles while walking one and striking out six in a 2-0 'Topes win, becoming just the seventh player in Isotopes history to toss a nine-inning shutout. His dozen wins are currently one shy of a team record. Eveland is the only Isotope named to squad, which consists of three members of the Omaha Storm Chasers, and is just the second pitcher to earn the PCL post-season accolade in team history, joining reliever Scott Strickland, who made the squad as a relief pitcher in 2009. The Isotopes' 2011 home schedule is over, but that doesn't mean there won't be more baseball this season in the Duke City. The Triple-A Baseball National Championship Game comes to Albuquerque on Tuesday, September 20, pitting the winner of the Pacific Coast League playoffs against the playoff winner in the International League in a one-game, winner-take-all showdown. In addition to the game, there will also be a pre-game autograph session with Dodgers legends Steve Garvey, Ron Cey, and Bill Russell, a fleece blanket giveaway courtesy Sandia Resort, and a post-game fireworks extravaganza.